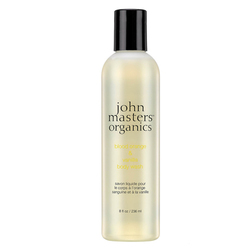 A gentle, non-drying, all-over cleanser with a refreshing citrus scent that treats the skin to a luxurious, head-to-toe cleanse. A new take on a fan favorite, this Geranium & Grapefruit Body Wash lathers into a rich, creamy foam to gently wash away dirt and oil without drying your skin. Essential oils of geranium, grapefruit & lavender tone and nourish, while offering a clean, invigorating scent. Follow with my Geranium & Grapefruit Body Milk to moisturize.